motan-colortronic focused on the theme of “service” during its participation at the K’Show this year. All questions about ancillary equipment technology could be discussed in the mo’s corner lounge area. Naturally, the visitor determined the subject. The selection of exhibits had also been tailored to specific requirements as motan-colortronic attaches great importance to comprehensive understanding of complete processes to offer users products and system solutions that are tailor-made for their applications – e.g. in injection moulding, extrusion, blow moulding or compounding – in short, in all disciplines and for all processing areas in the plastics industry. For motan-colortronic the importance of good customer service is paramount. This integral element in the customer/partner relationship begins long before the equipment start-up phase. Already the first information that those interested receive from motan-colortronic, whether customer, potential customer or student shows the comprehensive motan-colortronic service strategy. Expertise is the main focus point and it begins with news in the trade press, extending through to the “motan news” magazine right up to the “mo’s corner” or the “motan campus” training academy and ending in thorough product training prior to and after a system start-up. A lively exchange of experience also takes place behind the scenes among the motan experts – right across all disciplines – the valuable results of which are publicised for all to read. It is particularly important here that individual requirements or suggestions from customers and service representatives are taken into account and discussed in motan-colortronic’s circle of experts. This is how new products and product upgrades are developed, in some cases even new process solutions. It also leads to a greater understanding in the areas of drying, dosing, mixing, storage, and conveying of all conceivable types of plastic raw materials. This applies for injection moulding, extrusion, blow moulding and compounding, in all industries, from automotive through building construction, electronics, medical devices, packaging or whatever else. 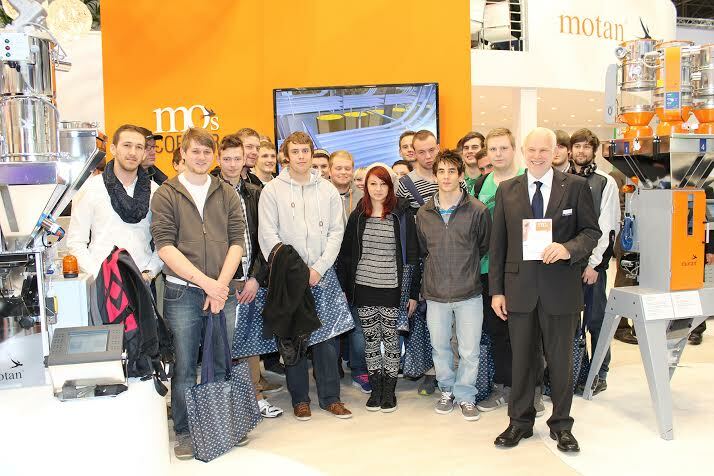 motan-colortronic’s expertise was put to the test during K 2013 at mo’s corner. The lounge was the central point of contact for injection moulders, extruder operators, blow moulders – in general, for everyone who has something to do with plastics. Discussions – took place in this comfortable meeting place – covering the new knowledge which motan colortronic specialists have gained in ancillary equipment technology used in plastics processing lines. The motan campus training academy also provides expert knowledge. This facility, first established at the beginning of 2013 in Friedrichsdorf/Germany, primarily offers staff and sales partners excellent possibilities for professional training in all plastics disciplines. The motan campus technical center is fully equipped with all modern equipment needed for seminars, workshops and training courses. Specific up-stream plastics processing technology of processing machinery (injection moulding, extrusion, blow moulding and associated processes) can be pursued here under realistic industrial conditions.